In response to the Trump administration’s cruel family separation policy, Care2 members and other committed activists have taken a stand against racism and xenophobia. Here are seven compelling examples of family, friends and nonprofits making a difference and fighting for reunification. When Shannon Cofrin Gaggero told her two young children about kids being separated from their parents at the U.S.-Mexico border, her 6-year-old son had an idea. Why not raise money to help these families with a lemonade stand? The Gaggeros set a goal of $1,000, but after a week they had taken in almost $13,000. The Gaggero family, along with some friends, started their lemonade stand and bake sale in Atlanta, Georgia. That initial event brought in $1,100, but more than 200 people also donated to a related virtual event on Facebook. This fundraiser is just one of many, as hundreds of thousands of people donate to nonprofits to help families who have been separated at the U.S.-Mexico border. These caring human rights advocates are responding to the heartbreaking images and audio of young children crying desperately for their moms and dads. Declaring its “zero-tolerance” policy, the Trump administration has cruelly separated around 2,500 migrant children from their parents. Although Trump signed an executive order reversing that policy, many of these children are still far away from their parents — and the government doesn’t even know where some of them are. The Gaggeros donated their proceeds to the Refugee and Immigrant Center of Education and Legal Services, or RAICES, a Texas nonprofit that provides free and low-cost services to immigrants. David and Charlotte Willner, a couple from the San Francisco Bay Area, started a fundraiser that has brought in more than $20,000,000, with contributions from over half a million people. The Willners said they felt they had to act after they saw a photo of a Honduran toddler weeping as she watched a U.S. border patrol agent search her mother. 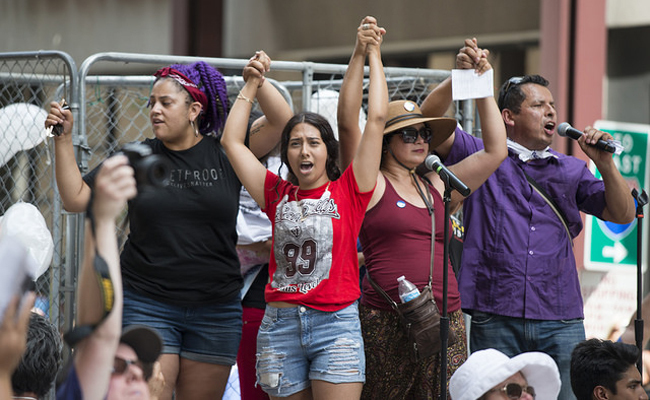 On July 10, the group announced that they planned to march to Capitol Hill with a $20 million check to pay for bonds for immigrant mothers to be released from detention centers. “Bonds often cost between $5 – 10,000, so our $20m can pay approximately 2,500 in one go. By offering this bond payment, RAICES hopes to help the administration comply with its court ordered obligations,” the group said. What is happening here is unfathomable, and despite what our government wants us to believe, what has been reported of parents being separated from children, people being forced to stay for days, weeks and months in cages, no opportunity to bathe for days and sometimes weeks – all this is happening. Alanna Gillis was headed for a beach vacation in South Carolina when she read that volunteers were needed at an immigrant shelter in Texas. “I said, ‘OK, I have this skill set, absolutely. When is the next flight that I can take?” explained Gillis. “Because I want to be able to do something, because I so vastly disagree with this.” So she and her twin sister flew to El Paso where they’re working at Annunciation House, a shelter for families recently released from detention. Immigrant Families Together is a group of volunteers who have raised over $300,000 to pay bond for detained parents. They have also arranged carpools across the country to transport immigrant families and to provide a temporary home for them. The American Civil Liberties Union has raised over $1 million to help provide legal representation for separated families. Model Chrissy Teigen and her musician husband John Legend donated $288,000 to the ACLU and encouraged others to join in, giving the campaign a serious boost. If you also feel that you need to take action in the face of this gross violation of human rights by the Trump administration, here’s a list of where you can donate money and services. Demand that ICE ensure that all phone calls between separated parents and children be free of charge by signing this Care2 petition. Brian F. A revised nursery Humpty Dumpty nursery rhyme for you. Humpty Trumpty sat on his wall. Humpty Trumpty had a "Great" fall. All the "Kings" golf carts and all the "Kings" henchmen could not put Humpty Trumpty back together and the nation became "Sane" and "Honorable" again. Thanks for posting. Build a wall around Donald Trump. E-verify employees, and send any employers who hire criminal illegal aliens to prison for 10 years. End sanctuary cities, and send any criminal illegal alien who overstays their VISA to prison for 10 years. End birthright citizenship, and build the wall in areas where it makes sense, and expand sophisticated electronic sensors along the border. If Trump were to do these things, illegal immigration could be reduced.